In 1999, a series of apartment bombings shook Russia and propelled the country headlong into the Second Chechen War. Nearly nine years after the attacks, which claimed 292 lives, many Russians remain unconvinced by the official version of events, which holds that Chechen separatists were responsible. Two sisters, who lost their mother in the attack, have written an open letter to President Dmitri Medvedev, urging him to mount a fully open, independent investigation. The sisters, Tatyana and Alyona Morozov, currently reside in Missouri. Their appeal (below) was published in the Wall Street Journal newspaper on May 30th. In three coordinated bombings of apartment buildings in Moscow and Volgodonsk in September 1999, 292 people were murdered, including our mother Lyubov Morozova. We are writing this open letter to call on you, Dmitry Anatolyevich, to order an independent, open and full investigation of these attacks. Although these crimes were blamed on Chechen terrorists and used to justify the resumption of a full-scale war against Chechnya later that month, there are numerous indications that Russian security services may have been involved. There is also clear evidence of a cover-up by the authorities. We do not consider this case solved. At about the same time, a Russian soldier discovered RDX in sacks labeled as “sugar” at his army base near Ryazan. The incident was never investigated and the evidence classified. 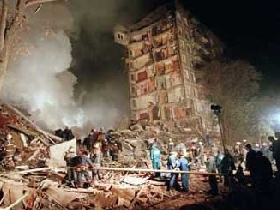 On September 13, 1999, the Speaker of the Duma, Gennady Seleznev, announced that an apartment house in Volgodonsk had been blown up – three days before the attack actually occurred. Mark Blumenfeld, the property manager of our house on Guryanova Street in Moscow that was blown up, told our lawyer and several journalists that FSB agents had “talked him into” changing his testimony. The agents showed him a photo of Achemez Gochiyayev, a Chechen he had never seen before, and under pressure he “identified” him as the man who had rented storage space in the basement. The composite sketch based on Mr. Blumenfeld’s initial description of what the real suspect looked like disappeared from the police file and was replaced with the photograph of Mr. Gochiyaev. Meanwhile, our attorney Mikhail Trepashkin, himself a former KGB agent, told reporters that he had recognized FSB agent Vladimir Romanovich from the police sketch. Romanovich was subsequently killed in Cyprus in a hit and run incident that was never solved. In November 2003, on the eve of the trial of two Chechens later convicted for transporting the explosives used in the Moscow bombings, Mr. Trepashkin was arrested after a gun had been planted in his car. This prevented him from submitting Mr. Blumenfeld’s statement to court that the FSB agents had pressured him to give false evidence. The trial of the two Chechens was not convincing to us or the world as it was held behind closed doors and human rights groups noted numerous violations of due process. Mr. Blumenfeld’s statement and the replacement of the police sketch with the photo of Mr. Gochiyayev was never reviewed by a Russian court. Four people investigating the FSB’s possible involvement in the bombings were assassinated. Duma Deputy Sergei Yushenkov was shot dead in Moscow in April 2003 and his colleague Yuri Schekochihin died of apparent poisoning three months later. Journalist Anna Politkovskaya was gunned down in October 2006 in her Moscow apartment block and a month later, former KGB agent Alexander Litvinenko died of poisoning in London. Many Russians have come to the conclusion that the bombings may have been the work of Russian security services. As for our family, our initial trust in the official version of a “Chechen trail” is long gone. We have come to believe that our mother and neighbors were sacrificed for a political end: To justify the war in Chechnya and help Vladimir Putin become president the following year. Only an objective investigation could make us change this view. Mr. President, we are writing this open letter because we would like to believe that your ascent to the presidency will end this dark period in Russian history. You were not involved. We realize that you owe the previous regime a debt of loyalty and gratitude. But the powers of the state were entrusted to you not to protect possible murderers. You are now in control of Russia and your position imposes a higher responsibility. Before history, the people and the memory of innocent victims, you have an obligation to find and tell the truth about these crimes.